We’d love your help. Let us know what’s wrong with this preview of A Spinoza Reader by Baruch Spinoza. This anthology of the work of Baruch de Spinoza (1632-1677) presents the text of Spinoza's masterwork, the Ethics, in what is now the standard translation by Edwin Curley. Also included are selections from other works by Spinoza, chosen by Curley to make the Ethics easier to understand, and a substantial introduction that gives an overview of Spinoza's life and the main th This anthology of the work of Baruch de Spinoza (1632-1677) presents the text of Spinoza's masterwork, the Ethics, in what is now the standard translation by Edwin Curley. 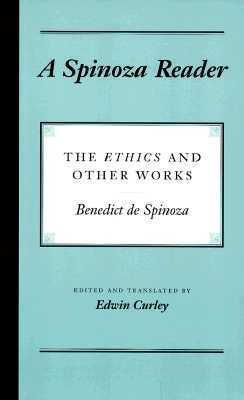 Also included are selections from other works by Spinoza, chosen by Curley to make the Ethics easier to understand, and a substantial introduction that gives an overview of Spinoza's life and the main themes of his philosophy. Perfect for course use, the Spinoza Reader is a practical tool with which to approach one of the world's greatest but most difficult thinkers, a passionate seeker of the truth who has been viewed by some as an atheist and by others as a religious mystic. To ask other readers questions about A Spinoza Reader, please sign up. This was a very difficult read, and it took a long time for me to complete it. I enjoyed this edition especially because the pre-Ethics stuff was much more straight-forward and was written in a more natural voice. The geometric method seemed similar to what I've read of Hegel. I enjoyed the format of the preposition (the statement) and the demonstration (explaining why the statement is true), and then usually a scholium (more commentary on the statement, typically taking it in an interesting dir This was a very difficult read, and it took a long time for me to complete it. I enjoyed this edition especially because the pre-Ethics stuff was much more straight-forward and was written in a more natural voice. That being said, this is still a very difficult text as it's a difficult subject and he's very thorough. The God part was confusing, as he seemed to be using the word 'God' in a way that is not the way Church-goers would use the word. Think of the most difficult and at the same time worthy thing you have done in your life. This book will not be read or understood by 99.999 percent of the human population; still, it is worth reading because it can change your life. Jews are still trying to effectively respond to Spinoza and that's not said lightly. Not much needs to be said. The final quote from the Ethics like the main quote from any religion suffices: “If the way I have shown to lead to these things now seems very hard, stil Think of the most difficult and at the same time worthy thing you have done in your life. This book will not be read or understood by 99.999 percent of the human population; still, it is worth reading because it can change your life. Jews are still trying to effectively respond to Spinoza and that's not said lightly. Not much needs to be said. The final quote from the Ethics like the main quote from any religion suffices: “If the way I have shown to lead to these things now seems very hard, still, it can be found. And of course, what is found so rarely must be hard. For if salvation were at hand, and could be found without great effort, how could nearly everyone neglect it? But all excellent things are as difficult as they are rare”. “All excellent things are as difficult as they are rare.” Enough said! When millenia-old waking nightmare that is Western history is finally over, and people wonder if any good ever shone through the brutality of our collective madness, they will be able to point to Spinoza's Ethics. The Ethics is not a book, it is a monument to thought and freedom. Spinoza's philosophy will change your life! At the very least, it will frustrate the hell out of you. The ultimate end of the man who is led by reason, that is, his highest desire, by which he strives to moderate all the others, is that by which he is led to conceive adequately both himself and all things which can fall under his understanding. The central role of reason in Spinoza's philosophy borders on the mystical. To the extent that we conform to reason, we conform to the true nature of reality. What is good is what is realized upon reason. God is pure reason. The ethical human being in the The ultimate end of the man who is led by reason, that is, his highest desire, by which he strives to moderate all the others, is that by which he is led to conceive adequately both himself and all things which can fall under his understanding. Spinoza is essential. Read it slowly and carefully. i think i was dreaming with open eyes. A decidedly well organized edition of Spinoza's Ethics. The organization easily lead the reader through Spinoza's thoughts and history as it relates to the development of his master work. To speak specifically to The Ethics, this is a surprisingly good demonstration of some problems with Descartes' work which could be done more simply because of Spinoza's lack of relation to a Religion after being kicked out of his Jewish community. In particular, The Ethics, if anything, is an excellent demonstr A decidedly well organized edition of Spinoza's Ethics. The organization easily lead the reader through Spinoza's thoughts and history as it relates to the development of his master work. To speak specifically to The Ethics, this is a surprisingly good demonstration of some problems with Descartes' work which could be done more simply because of Spinoza's lack of relation to a Religion after being kicked out of his Jewish community. In particular, The Ethics, if anything, is an excellent demonstration of a philosophical approach (rather than a purely mathematical approach) to axiomatic methodology on topics of ethics and religion. Hard to imagine now how shocking this was in 1664 ("God is not a person; there is no free will; tolerance is the only rational politics"). Trying to understand Spinoza without Curley's notes (which are about twice as long as the primary material) is a decade's work. Excellent build up with smaller letters and writings from Spinoza, building up to the arguments he would expand on in The Ethics, many of which help make stuff that would be very confusing in that work clearer. *Only read the Ethics, but I'm going to count it. A Spinoza Reader is a good book; the little introduction and excerpts from works previous to the Ethics helped me form a 'clear and distinct' idea of Spinoza and his work. I think he's only interesting historically, and I do not get why people rate his philosophy highly still. Clearly he was an intelligent man, and was able to expose the gaps in his contemporaries' theories concisely. I think he had a lot of good ideas, and really did pre-empt a lot of philosophy and psychology to come. However, A Spinoza Reader is a good book; the little introduction and excerpts from works previous to the Ethics helped me form a 'clear and distinct' idea of Spinoza and his work. I think he's only interesting historically, and I do not get why people rate his philosophy highly still. Clearly he was an intelligent man, and was able to expose the gaps in his contemporaries' theories concisely. I think he had a lot of good ideas, and really did pre-empt a lot of philosophy and psychology to come. However, the way he presents and reasons out those good ideas is torturous, and first leads through a swampy land of supposedly self-evident axioms and propositions (beware, if you stand in place too long, trying to tie together a proposition and its precedents, you will sink into that swamp). I don't get him. He takes up the interesting and perhaps noble idea of geometerising a philosophy of ethics from first principles, but then resists describing nature with mathematics. Why? Instead he battles with the ambiguity of words... substance, essence, infinities, modes... if he had been born a bit earlier he might have fit in nicely with scholasticism (what if he had been born later?). Why do so many others rate him so highly? Perhaps they are overly impressed with the style? As Spinoza seems to imply in the last sentence: if it's difficult to comprehend it must be excellent? I don't deny it was a great work. WAS a great work. On the other hand, it's no tragedy if people decide to live by the Ethics; they would good people by anybody's measure - just don't bring up gods or infinity. side note: I really appreciate the letters included in the book - they show to me his private and publish writings are alike in their obfuscation. I am still in the process of tackling the Ethics. Througout his life Spinoza sought to find the proper expression of his metaphysical hypothesis that the univese was a unitary whole. Spinoza was concerned with the God of the Philosophers and not the God of Scriptures or the religionists. He is often misunderstood to be an atheist because of his rationalist approach to philosophical inquiry. His ideas got him ejected (excommunicated) from his synagouge. Because of his rationalist convictions Spin I am still in the process of tackling the Ethics. Througout his life Spinoza sought to find the proper expression of his metaphysical hypothesis that the univese was a unitary whole. Spinoza was concerned with the God of the Philosophers and not the God of Scriptures or the religionists. He is often misunderstood to be an atheist because of his rationalist approach to philosophical inquiry. His ideas got him ejected (excommunicated) from his synagouge. Because of his rationalist convictions Spinoza sought to express his philosophy in geometric form. This book contains other works including his critique of traditional religion - a must read. okay, the ethics was probably the most pivotal piece of literature i have ever read. however, anyone hoping to obtain as much from it as possible must read the theological-political treatise first, because it puts in a figurative context the ideas that spinoza later abstracts geometrically in the ethics, and it's important to see the progression of his ideas as he worked on the ethics... unless of course you feel like laboring unnecessarily over it. The works of Spinoza should be on the shelf of every curious mind searching to build arguments against Descartes. Spinoza is an essential to understanding contemporary philosophy of mind. I read him more than any other philosopher of the period. Does one need to understand Descartes in order to understand Spinoza? Yes. One must read Spinoza to understand Descartes as well. These two philosophers gave birth to all philosophical works in their wake. Spinoza is a key for understanding Hegel. Good translation, nice selection of works. Unexpectedly easy to read and applicable to the current religious/political situation in the USA. It does provide and interesting view in to the minds of the creators of our eduction system. His magnum opu Baruch Spinoza was a Dutch philosopher. The breadth and importance of Spinoza's work was not fully realized until many years after his death. By laying the groundwork for the 18th-century Enlightenment and modern biblical criticism, including modern conceptions of the self and, arguably, the universe, he came to be considered one of the great rationalists of 17th-century philosophy.